Perhaps you've come here from Terri Burson and that means that Today we (Crackerbox & Suzy stamps company) have a blog hop with the Sweet Petunia company and their MISTI tool. 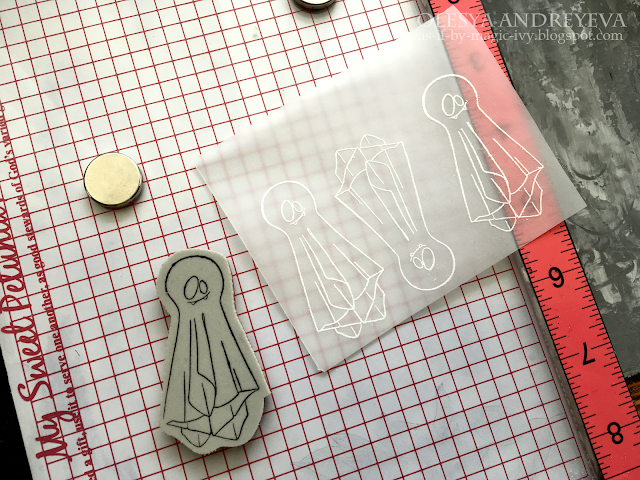 I love very neat and well-stamped cards and this stamping tool makes its work perfectly. For this event, I've prepared a Halloween card using Crackerbox & Suzy stamps from the latest release. I cut out a panel and sponged it with Seedless Preserves Distress Oxide, Faded Jeans Distress Oxide, and Black Soot Distress Oxide at the edges. Die cut Gates out of black cardstock. These were Heartfelt Creations Ornate Gateway dies. Using MISTI I stamped the ghosts onto a piece of vellum with Emboss It ink and heat embossed in white. Cut out it with scissors. Colored the eyes with a black liner. Added a pair of googly eyes to one of the ghosts to make it look funny. Printed out my sentiment using an ordinary laser printer. Stephanie Severin --- Your next stop. We will choose two lucky commenters from the hop to win one of two prizes: a $50 shopping spree at www.mysweetpetunia.com and a $50 shopping spree at http://www.sosuzystamps.com/ !!! All you need to do is to leave your comments no later than Friday, August 24th, at 11:59 PM Central time and winners will be announced on Tuesday at My Sweet Petunia and on Friday ( Aug 31st) at the Crackerbox & Suzy blog. thank you for reminding me that everything doesn't have to be on cardstock. The vellum ghosts are too cute! TFS! Love this and the eyeballs too. Perfect haunting scene. Love the vamp ghost!!! Background awesome. Gorgeous blended background! Gorgeous gates!!! and Gorgeous ghosts with one having googly eyes!! You rocked this fabulous card! Oh my! I LOVE this card, and your beautiful style! 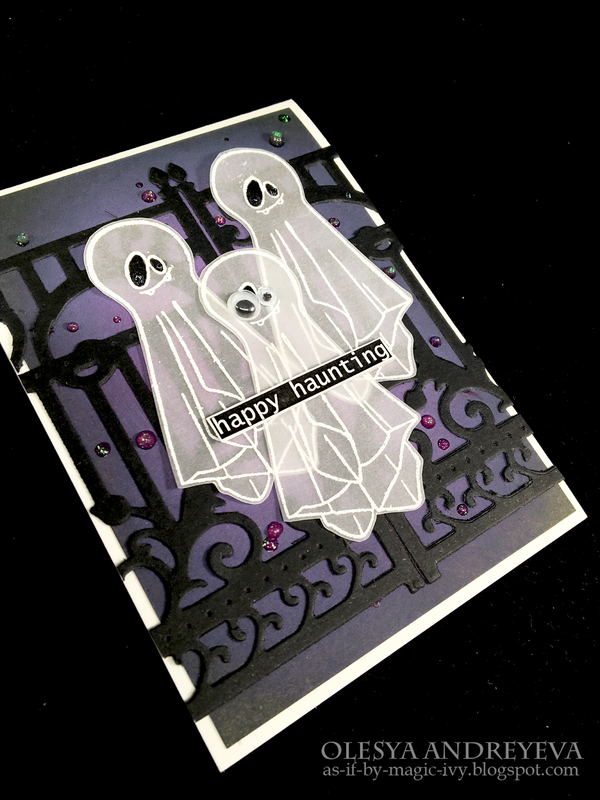 The vellum stamped ghosts really make this card look fun, and I am SO inspired by your amazing card! Your vellum-hazy ghosts are awesome! Thanks for sharing. Oh my goodness.. I love your ghosts. This is pretty! Thanks very much for the inspiration . This is the coolest Halloween card! I love the die cuts and the way you did the ghosts! Those ghosts are even better on vellum! Love the ghosts on vellum. Looks great on vellum! Love your ghost stamp! Awesome card! Loved the gate. Love that card! The ghosts are so awesome. Amazing card. Love the gates and ghosts. A great use of vellum for a card! Thank you for sharing how you made your card! Just darling. LOVE the vellum ghosts, very great idea. Love the purple, your background is amazing. And love the different size googly eyes. So fun! Fantastic card! So perfect to make the ghosts from vellum - genius. Stunning background and design. Really cool card! The ghosts look great cut out of vellum and the googly eyes on the middle one is perfect LOL. Such a fun and spooky card! 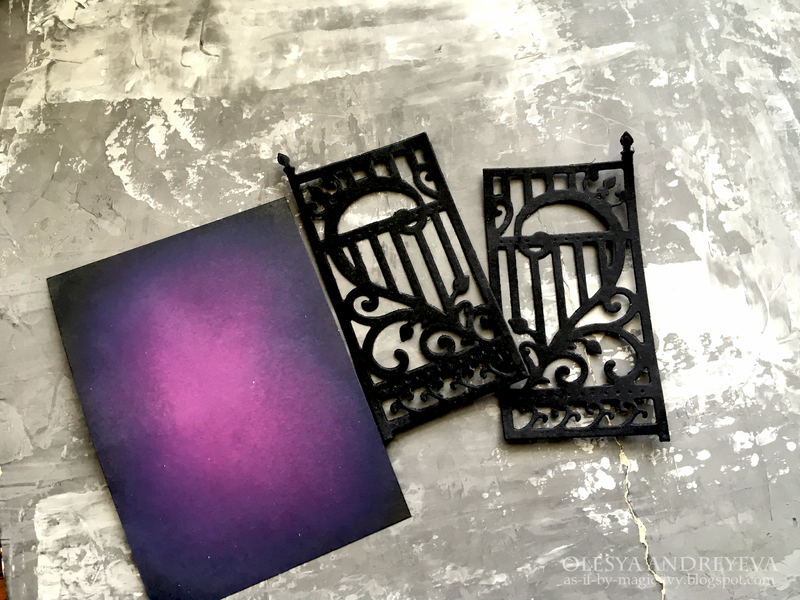 Love the wrought iron gate you created and love the idea of stamping the ghosts onto vellum! Wow, this card is sooooo clever! Love the spooky ghosts, especially the googly eyes addition! Great job! This is a lovely card with the use of vellum. Thanks for the inspiration. I am SO getting that ghost vamp stamp - awesome design you created and so glad you did! Love the card; a definite CASE candidate for me so pinning it for future reference! Love everything about it! Very creative card! I loved that you used vellum for the ghosts! And that background all I can say is a big WOW!! I also love the fence behind them too so very cool looking! Awesome card! Love those vellum ghosts! thank you sooo much for you kind words, i appreciate it with all my heart!!! Fantastic card! I love the ghosts on the vellum - such a great ghostly effect! Fun and spooky. I like the gates. That’s such a fun Halloween card ! I like the design of the ghosts.